These days, if you look around a crowded parking lot, you’re bound to spot a set of dealer plates. That’s because low gas prices and a healthy job market led to record high car sales in 2014, and some of those sales—particularly pick-up truck and compact SUV sales—have continued through 2015. Since someone has to be making those sales, servicing those cars, and drawing up those financial documents, EMSI decided to take a look at what this sales boom means for the labor market. Who works in this industry? Where is this industry growing? 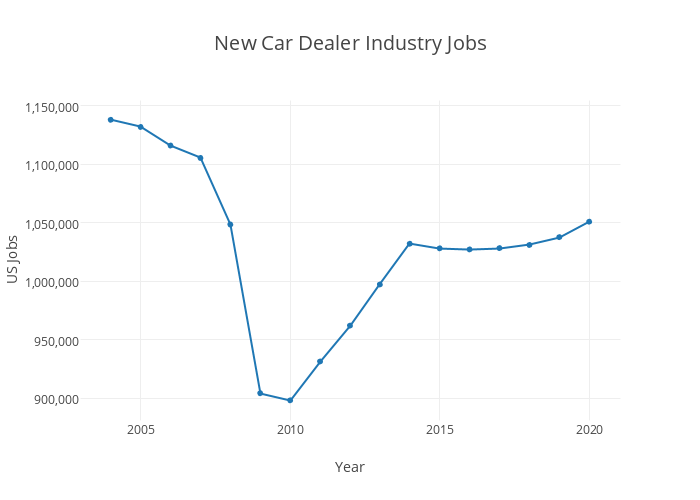 As we might expect, jobs in the new car dealer industry have grown as the country has recovered from the recession, reaching 1.03 million jobs in 2014 (although the industry has still not caught up to its pre-recession job totals). And jobs in this industry are projected to see growth in the future as well—with a slight dip over the next few years before picking back up. This growth is good news. The new car dealer industry is intimately connected to US manufacturing, generates valuable retail business and employment, and pays well, too. The national average annual earnings in the new car dealer industry is $63,091—a solid, family-sustaining wage for an industry that largely requires less than a bachelor’s degree for employment. Using Analyst staffing patterns, we identified the occupations that make up the new car dealer industry and plotted the most-represented occupations in the table below. Retail salespersons and automotive service technicians and mechanics certainly account for the largest portion of the industry. But job growth is even; each of these occupation saw about 15% growth between 2010 and 2014. New car dealers are not evenly distributed throughout the country. Florida and Texas account for about a quarter of national job growth in the new car dealer industry between 2010 and 2014, and even these two states have areas with very high and very low concentrations of jobs. California has a large portion of jobs in this industry as well, although new car dealer job growth isn’t as strong there as it is in Florida or Texas. Meanwhile, expensive real estate costs drove large car lots out of Washington, D.C., causing the capital to lose its last traditional car dealership last year. In order to identify where new car dealer jobs are flourishing, EMSI used data from Analyst to investigate which regions have the most competitive job growth (also known as competitive effect). Keep in mind that a positive competitive effect indicates that the regional industry is outperforming national trends (both overall national trends and national trends in that specific industry). The following 10 metropolitan statistical areas saw the highest concentrated growth (or competitive effect) in the new car dealer industry between 2010 and 2014. Note that the top seven metros are in Florida and Texas, with a significant drop in competitive effect between the 7th and 8th metros. Since the recession, Florida and Texas have experienced exceptional job growth (a trend that is captured by our Labor Market 150 Index), and both have seen impressive increases in net migration. A glimpse into their post-recession recovery stories might provide an explanation for why the new car industry, which is so closely tied to consumer confidence in the economy, saw much faster growth than the national average (see chart below)—and why the industry’s boom in Texas might be in jeopardy in 2015. By taking advantage of low construction costs during the downturn, the tourism industry in Florida was able to build and renovate tourist attractions, creating an influx of new jobs and allowing the state to recover remarkably well from the recession. In fact, some analysts predict that Florida’s unemployment rate may soon dip below the national level. As is appropriate for an economy that is largely driven by tourism, people go to the Sunshine State to buy things and have fun, making sales a huge part of the economy. Last year, EMSI published an article about the rise and fall of sales jobs, and our analysis concluded that there is a large concentration of sales jobs in Miami and Tampa (among other Florida metros), likely influenced by new car dealers. Wages for jobs in the new car dealer industry are lower in Orlando and Tampa than most of the other high growth regions in our table, although these wages are still on par with the national average. According to Brian Kelsey, an economic development consultant in Austin and longtime EMSI client, Texas saw so much post-recession growth that some people were calling it a miracle. Like other retail industries, the new car dealer industry has been benefiting from the state’s booming economy, growing 24% between 2010 and 2014. But Texas’s job growth is slowing down due to low oil prices, and job losses in the oil and gas industries could spread to other sectors. While low gasoline prices are encouraging car sales in most parts of the country, many Texans who work in or are affected by the oil and gas industries may hold off on large purchases until oil prices pick up. If that’s true, it’s possible a ripple effect of job losses could reach the new car dealer industry, especially in Houston where the economy is closely tied to oil. However, Austin leads the nation for competitive effect in the new car dealer industry, and its economy is very different from the oil-producing parts of Texas. As a top metro for venture capital investment and tech companies, the labor market in Austin is closer to what you’d find in Silicon Valley than in the oil patch.